One of the fox cubs — not Ears, who is still resident in the garden as far as I know, but one of the other two cubs who still occasionally visit the garden for food — has been limping over the last few days. He or she (let’s fix on “he”, otherwise this entry will be even longer and more stilted than usual) is getting around quite happily, but just not putting his right rear leg to the ground. I had a chat with Wildlife Aid to see if they had any suggestions. Since he is still quite mobile, we decided it wasn’t going to be a great idea to try to trap him; as he’s not coming to the garden that often, just for food, we’d be much more likely to get one of the other foxes (or one of the cats). 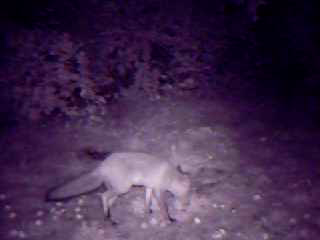 Limping can be a sign of mange so I’ll put some mange treatment in the foxes’ food for the next while and see if that helps (he doesn’t appear to be scratching, though), and also keep an eye out to see if he shows up on Foxcam looking any less well.